The Centers for Disease Control and Prevention recently released stats that are downright scary! What is true in both scenarios is that many don’t even know they have it: seven million who have diabetes don’t yet know it and only eight percent of people with pre-diabetes know they have it. The good news is if pre-diabetes is diagnosed and managed from the outset, the progression to type 2 diabetes can be greatly reduced if not prevented entirely. Research shows the keys are: losing five to seven percent of your body weight (10 – 20 pounds for someone starting at 200) and getting in 150 minutes of activity at least five days a week. People with type 2 diabetes can also lead a very healthy life (if they take their diabetes seriously starting day one, follow a healthful eating plan, get and stay physically active and, work with their health care provider to take the appropriate medications as their type 2 progresses over time. But unfortunately, there’s lots of misinformation out there and many don’t know where to turn to get the straight scoop on diabetes. 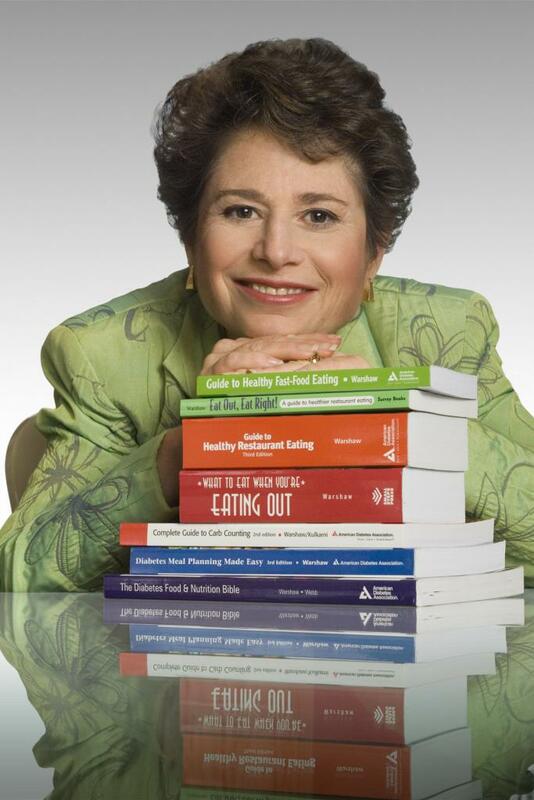 To help me sort out the myriad of information and get the “un-sugar-coated” facts about diabetes, I turned to expert Hope Warshaw, registered dietitian, certified diabetes educator and author of several books about healthy eating for diabetes. Tell us Hope why you have dedicated your career to diabetes management? Thanks for asking! Diabetes actually found me. My first job, way back (ouch, I hate to say it) in 1979, was in a unique diabetes program at Grady Hospital in Atlanta. I have stayed engaged in the diabetes field over these 30 years. Unfortunately over time, diabetes, especially type 2, has grown exponentially world-wide. Because food choices and eating habits are so integral to managing diabetes, it’s a great place for an RD to do good work. I am hopefully reaching people far and wide indirectly as the author of several books for American Diabetes Association and author of articles in Diabetic Living. What are the most common misunderstandings about Type 2 diabetes? Many assume that type 2 diabetes isn’t the “serious” type and that it’s typically diagnosed later on in life. Many also assume that people who are diagnosed with type 2 diabetes just need to follow a healthy eating plan, lose a few pounds and perhaps over the years, they’ll need a “diabetes” pill. Research, which has been accumulating over the last two decades, underscores that type 2 is a progressive disease and the progression is typically kicked off nearly a decade before diagnosis. Insulin resistance, due to excess weight mixed with a positive family history, are common culprits. Type 2 diabetes is now being diagnosed in younger adults and even children. By the time of diagnosis, most people have already lost half to three-quarters of their insulin making pancreatic beta cells. Expert guidelines now recommend starting individuals on a blood glucose lowering medication to treat the insulin resistance right out of the starting gate, most commonly metformin. It’s now known that insulin production will dwindle further over time. Most people will need a progression of blood glucose lowering medicines over the years. The good news: research shows early and aggressive management to control blood glucose can slow this progression. Healthy eating, losing a few pounds, and being physically active will always offer an assist. Is controlling blood glucose goal number one? Having type 2 diabetes carries a risk factor equivalent to having had a heart attack or stroke. The most common complication of type 2 is heart and blood vessel diseases, not eye or kidney disease, as is often thought. Research has shown that to get and stay healthy over time, people with type 2 need to focus squarely on their ABCs: A for glucose control (both the daily glucose numbers and the two to three month A1C result), B for blood pressure and C for cholesterol (more correctly blood lipids – LDL, HDL, triglycerides). Studies show that when people think diabetes, they think glucose. They don’t make the link between diabetes and circulatory problems. Yet, three-quarters of people with diabetes have high blood pressure. Isn’t losing weight the key to controlling blood glucose? Research shows that the greatest impact of weight loss on blood glucose is in the first few years after diagnosis – as early on as possible. In fact, the biggest bang per pound is in the pre-diabetes phase. With a loss of 5-7% of body weight and 150 minutes of physical activity, research has shown people can prevent or delay the progression to type 2. Once insulin production is on a dwindling course, weight loss will have less impact on glucose control. So, five, ten years after diagnosis, losing weight is unlikely to correct high glucose numbers. Reality is if blood glucose is out of control, it’s time for medication. What about carbohydrate? Is it best to eat a low carbohydrate diet? Nutrition recommendations for people with type 2 diabetes from the American Diabetes Association and other health authorities echo the recently unveiled U.S. 2010 Dietary Guidelines for carbohydrate consumption: about 45 to 65% of our daily calories should come from carbohydrates. (Americans currently eat about 45- 50% of their calories as carbohydrates.) Countless research studies do not show long term benefit of low carb diets on blood glucose, weight control or blood fats. People with type 2 diabetes, like the general public, should lighten up on added sugars and sweets (they’re mainly carbohydrate with minimal nutrition). They should eat sufficient amounts of fruits, vegetables, whole grains and low fat dairy foods — all healthy, nutrient-packed sources of carbohydrate. What do people with type 2 diabetes need to do to get and stay healthy? First is facing the diagnosis promptly and taking action immediately and continuously tracking and controlling blood glucose, blood pressure and blood cholesterol – those ABCs. Type 2 diabetes is such an easy disease to deny because nothing typically hurts. And what we’re learning is that it doesn’t take years to develop the diabetes complications, most commonly for type 2 heart and blood vessel disease. These can predate the diagnosis or occur shortly thereafter. But don’t let anyone tell you this is all easy….losing weight, eating healthfully, being active is tough to do in our culture. Find yourself some support. It will come in handy! What resources do you recommend that are credible and the most help to those with either pre-diabetes or Type 2 diabetes? Well, of course, my books which can be found wherever books are sold and conveniently at www.hopewarshaw.com. If people want to get straight facts all about type 2 diabetes in bite size snippets, I recommend Real Life Guide to Diabetes. If they want to dig into what to eat, how to frame in a healthy eating pattern for themselves and how to address making those challenging lifestyle changes, I recommend Diabetes Meal Planning Made Easy. Both books are published by American Diabetes Association and can be easily purchased via my website www.hopewarshaw.com or ADA’s www.shopdiabetes.org.